Israeli police officers demolished, on Monday morning, the al-‘Araqib Bedouin village in the Negev, for the 82nd consecutive time, rendering the families homeless again. 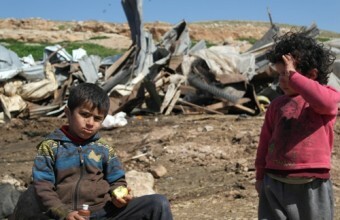 Resident Salim al-‘Araqib said dozens of police vehicles, and undercover units of the Israeli military, accompanied by bulldozers and trucks, invaded the village before forcing the residents out of their sheds and homes, and demolished their structures. Seeking a temporary shelter, the families had to go to the local cemetery. After the destruction of the Bedouin structures, the soldiers and military bulldozers headed towards “Line 31 Area," where the villages of Um Ebtein, Houra, ‘Arad and Kaseefa and located. Israel repeatedly invades and demolishes residential sheds and structures in the al-‘Arakib, and other villages in the Negev, as part of its “Negev Development Plan,” that aims at displacing all the Bedouins in the Negev to relocate them in Shqeib as-Salaam village. The Israeli plan aims at building settlements and malls, after removing the residents who have inhabited the area since before Israel was established in the historic land of Palestine in 1948. The Israeli occupation bulldozers on Sunday knocked down a Palestinian civilian home in Jerusalem’s town of Abu Ghush allegedly due to unlicensed construction. Arab MK Basel Ghattas said the Israeli bulldozers demolished a Palestinian house west of Occupied Jerusalem city in such a remarkably “brutal” manner. The two-story house is said to be owned by the Ibrahim family and that its license procedures have been underway to finalize the construction. Ghattas called on the villagers to pitch a sit-in tent in protest at the arbitrary demolition, which he dubbed a retaliatory move acted in response to the natives’ election of the joint Arab list in Israel’s latest polls. Meanwhile, dozens of Palestinian activists joined a sit-in staged in front of the Sablaban family house in Jerusalem’s Old city in protest at Israel’s mounting evacuation threats and tactics of ethnic cleansing. Earlier, one week ago, a bunch of Israeli vandals, escorted by police squads, tried to break into the Palestinian family home, but the natives stepped in and thwarted the assault. The family appealed to the Israeli Supreme Court to issue a decision banning Israeli settlers from storming the house. Another hearing to appeal an eviction decision is set to be held sometime by the end of May. The family raised concerns that the Israeli fanatic settlers might re-break into their house, calling on the human rights groups and activists to stand by them in such dire circumstances. The Israeli army, and personnel of the Jerusalem City Council, delivered late on Sunday demolition notices targeting five Palestinian homes in Ein al-Louza and Be’er Ayyoub neighborhoods, in Silwan town, in occupied East Jerusalem. The Wadi Hilweh Information Center in Silwanic (Silwanic) has reported that the soldiers invaded the two neighborhoods, and took pictures of several roads and homes. The Center added that the soldiers glued the orders on five Palestinian homes, including an under construction building. The family that owns the under construction building started building it four years ago, and had to stop after receiving similar orders. Eyewitnesses said three of the homes were built in Ein al-Louza, nearly two years ago, and their owners have been inhabiting them since then. 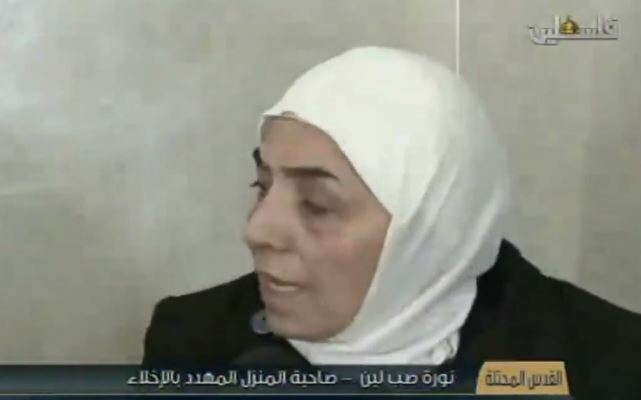 In Be’er Ayyoub, soldiers glued an order on the home of resident Walid Ahmad Abdul-Razeq, granting him 30 days to appeal. Abdul-Razeq told Silwanic that this is the fifth order he receives despite the fact that he never built or added any room to his home, and that the order did not even include any name. Amidst repeated invasions, assaults and attacks by extremist Israeli colonialist settlers attempting to displace a Jerusalemite Palestinian family, and occupy their building, Palestinian residents and Israeli peace activists, started guarding a Palestinian building, inhabited by the family for more than 60 years. The activists gathered in ‘Aqbat al-Khadiyya, just a few meters away from the Al-Aqsa Mosque in occupied Jerusalem, drumming and chanting “No to the occupation,” expressing solidarity and support with the Palestinian family that inhabited the building for more than 60 years, Christine Rimawi of Palestine TV said in her report. The activists are constantly in and around the property hoping to foil all Israeli attempts to remove the indigenous Palestinian family, and replace them with colonialist settlers. The property in question is owned by a Palestinian family, that rented it to a Jewish family, prior to the establishment of Israel in the Palestine in 1948, and in 1953 the Jewish family rented the home to Sob-Laban family. Under Israeli renters' protection law, the Sob-Laban family that rented the property 62 years ago, is supposed to be protected and secured as they have been paying, not only their monthly rent, but also property taxes to the Jerusalem City Council. The family is currently awaiting a verdict on an appeal it filed to an Israeli court, that would render its ruling by the end of this coming May. Palestinian Researcher, specialized in settlement affairs, Ahmad Sob-Laban, said the Israeli law allows the Israelis to demand removing the Palestinians from their rented homes, but at the same time deny all Palestinians, Muslims and Christians, from demanding to return to their homes and property, they owned before the Nakba of 1948, whether in Jerusalem, including West Jerusalem, or in other parts of Historic Palestine. The family is now fighting for their existence in their home, awaiting the court ruling, nevertheless, subject to daily attacks by Israeli fanatics who want to remove them, and render their homeless. Their current steadfastness is supported by Israeli peace activists who are also subject to constant harassment by fanatic Israeli groups, and by the Police. Israeli bulldozers, escorted by police, demolished homes and animal barns in Bedouin villages across the Negev, late Thursday. 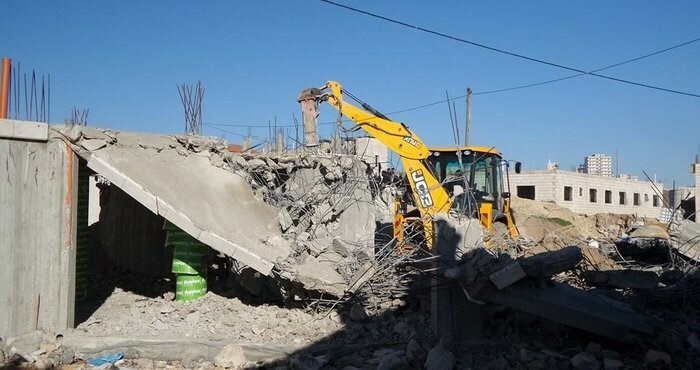 Several homes and animal barns were demolished in Rahat, al-Laqiya town and Bir Hamam, while Israeli forces also surrounded a house in Bir Hadaj belonging to the al-Abraq family, in preparation to demolish it. According to Ma'an, activists in the Negev called on Arab Knesset members to prevent demolitions in the area by all means. Demolitions, in addition to denial of basic services and access to infrastructure, are part of an ongoing campaign by Israeli planning and construction committees against the Bedouin villages in the Negev desert, where roughly 70-90,000 people live. In May 2013, an Israeli government committee approved a draft bill setting a framework to implement the evacuation of "unrecognized" Bedouin villages in the Negev, most of which existed before the state of Israel. Bedouins in Israel live in 45 unrecognized villages scattered primarily in the region between Beersheba and Arad. They are the remnants of the Bedouin population that lived across the Negev Desert until 1948, when 90 percent were expelled by Israel and the remainder confined to a closed reservation. Israeli Occupation Forces (IOF) advanced to a limited extent into southern Gaza Strip on Thursday morning and bulldozed lands. 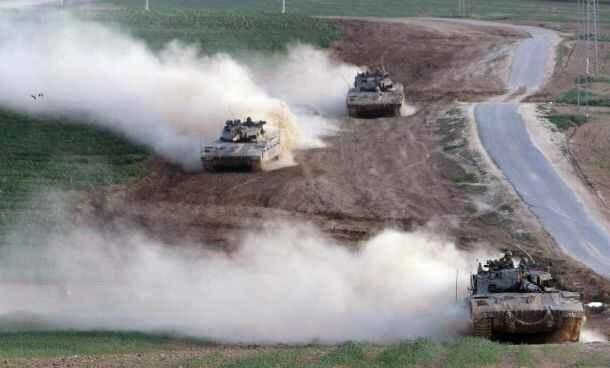 Quds Press said four army bulldozers escorted by a military vehicle advanced into eastern Rafah and leveled land. Leveling of lands took place amid intense firing at Palestinians’ houses and shooting of smoke bombs. The inhabitants had to leave their farms, the agency said. The incursion is another episode in the series of Israeli daily violations of the Cairo-brokered truce accord signed in the wake of last summer’s offensive on the besieged coastal enclave, which killed over 2,300 Palestinians, mostly civilians. The Israeli Occupation Forces (IOF) uprooted Wednesday more than 150 olive trees in Mualla area to the south of al-Khalil. Local sources said that Israeli bulldozers uprooted more than 150 olive trees belonging to a local family under the pretext of being located in an area that falls under Israeli control. 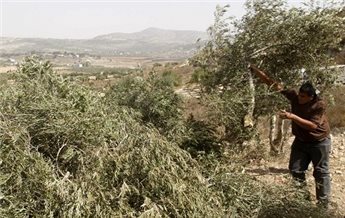 The uprooted trees are located near Tina settlement built illegally at the expense of Palestinian lands in Dahriya area, the sources added. 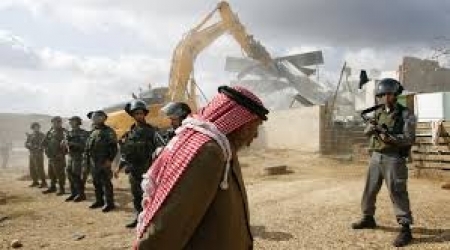 Meanwhile, IOF demolished also on Wednesday more than 20 housing units during a large-scale military operation in the northern Jordan Valley to the north of the West Bank. Eyewitnesses reported that Israeli soldiers stormed Hodeidah and Makhoul areas in the Jordan Valley accompanied with military bulldozers and demolished a number of housing units and livestock barns. Approximately ten vehicles of Israeli Civil Administration crews have stormed on Tuesday the area and filmed a number of facilities. Israeli forces, on Wednesday evening, uprooted 300 olive trees and destroyed more than 5,000 meters of stone barriers belonging to Palestinians in the village of Majdal Bani Fadil, south of Nablus. Ghassan Daghlas, a Palestinian Authority official who monitors settlement activity in the northern West Bank, told Ma'an News Agency that dozens of Israeli military vehicles and bulldozers raided the area in the evening. He said that the soldiers entered the Kfar Ataya area, located on the northern side of the village, and uprooted hundreds of trees. Daghlas told Ma'an that the trees belonged to villagers Maher Abd al-Raouf Khatib and Bashar Abdullah Ahmad. He said that they had been planted as part of an agricultural project in the area. Israeli authorities have apparently objected to the project and Daghlas said the matter was currently in court. An Israeli military spokeswoman did not immediately respond to a request for comment. Majdal Bani Fadil is located on the eastern edge of the Nablus region, and is surrounded by areas under Israeli military control as well as Israeli settlements on all sides. Israeli occupation forces this morning held a military operative in the areas of Makhoul and Al-Hadidiyya, in the northern valleys, where bulldozers demolished dozens of homes and livestock barns, and confiscated two water tanks in Al-Farisiya, with no previous warning. Israeli forces arrived to Khirbet Makhoul in the early morning, where they demolished homes without any previous warning or official paper work, PNN reports. Soldiers surrounded the area and formed a security cordon around it, detained a number of citizens who tried to reach their homes, and threatened them with evacuation, despite their having legal property and rent papers. Deputy Governor, Ahmed As'ad headed to the area by the early hours of today, accompanied by the Valleys file official, Mutaz Bisharat, and director of the civil association Ayman Sawafta. As'ad denounced the Israeli continuous demolitions, saying that these actions show the hypocrisy of Israeli claims of "democracy", since it comes a day immediately following the elections. As'ad added that Israeli authorities were willing to evacuate the valley of Palestinians for settlement expansion and Judaization projects. In a statement which PNN received, As'ad added that the governor, in cooperation with the local and international associations, are to rebuild what the occupation has demolished. He called on the international community to take immediate action and stop the Israeli crimes, which contradict the Geneva fourth convention calling on security for the people. Meanwhile, Israeli forces, at 6:00 AM on Wednesday, handed out eviction notices to homes and agricultural lands within an area of approximately 36 acres. The pretext: “It is state land”. 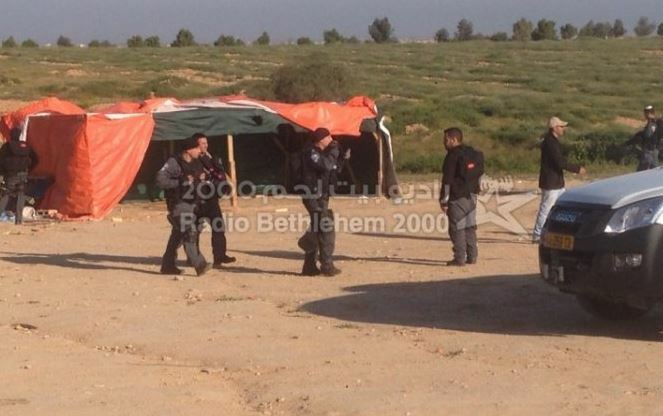 Soldiers delivered up to 18 evacuation notices to the population of the area south of Hebron, in the last month. 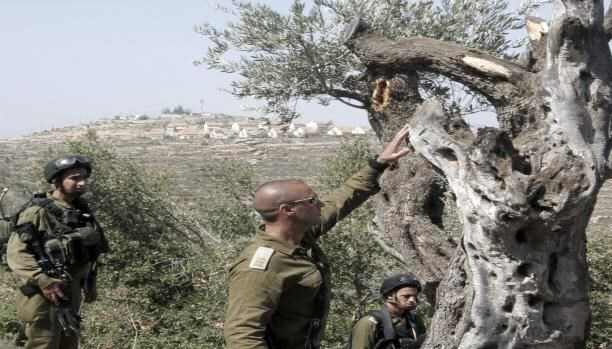 A few days earlier, in the same area, Israeli forces supported by Civil Administration powers, uprooted 150 olive trees within about 40 acres from the private land of farmer Adam Ibrahim Nassar. Grass roots municipality, with the help of a group of NGOs, started to document the various Israeli offenses and attacks. The group calls upon the need of citizens to document such crimes. Israeli soldiers invaded, Wednesday, two Palestinian villages in the central West Bank district of Tubas, and demolished a home and four residential structures. The Palestinian News & Info Agency (WAFA) has reported that several military vehicles, and armored bulldozers, surrounded two villages in Tubas, before invading them. WAFA added that the soldiers demolished four residential structures in the Khirbit al-Mathoun village, after violently forcing the families out. 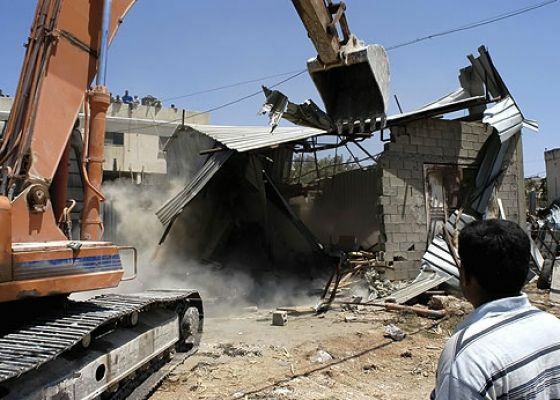 The soldiers also invaded Khirbit al-Hadeediyya area, in the Northern Plains east of Tubas, and demolished a home. The latest attacks are part of numerous repeated violations targeting Palestinian communities, especially Bedouin communities in Tubas, in an attempt to force them to leave for the benefit of illegal construction and expansion of settlements, and for military purposes, including live fire training. 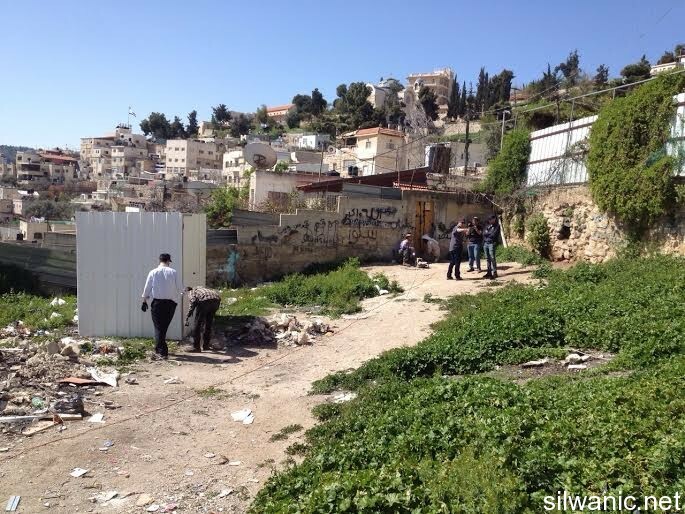 The Wadi Hilweh Information Center in Silwan (Silwanic) in occupied East Jerusalem, said Israeli extremists broke into, and occupied, a residential building inhabited by the al-Malhi family, and two lands in Wadi Hilweh. Silwanic said the extremists forged the properties' deeds; an issue that enabled the Elad settlement group to invade the building and occupy it. The property in question has four apartments. The center added that the settlers, and their armed guards changed the locks on all doors, blockaded the windows, while the Police prevented the residents from entering the area, leading to clashes. The Police then attacked a child, identified as Mohammad al-Malhi, 13, and placed him in one of their vehicles while beating him, before some residents managed to secure his release. Silwanic said that, in 2007, the Elad group attempted to occupy the building, composed of four apartments and an 800-Meter land, but the family headed to court and managed to retrieve its property. Elad claimed that the Malhi family was living in a property that belongs to the Absentee Property Department. The al-‘Abbasi family, that has been living abroad since many years, owns the building. Silwanic said the District Court in Jerusalem, and the Central Court, previously affirmed the al-Malhi family has all legal document to inhabit the property. The ruling came after a five-year legal process. The al-Malhi family said that, after the court ruling was made, one of its members forged some documents, an issue that made it easy for Elad to occupy the property. The family added that the Israeli police handed, on Tuesday evening, their son Montaser, 18 years of age, an order for interrogation, and when they accompanied the child, on Wednesday morning, they were all detained while the settlers occupied the building. The police also detained Seraj al-Malhi, 12, and Samah al-Malhi, who were alone in the building during the time of the attack. 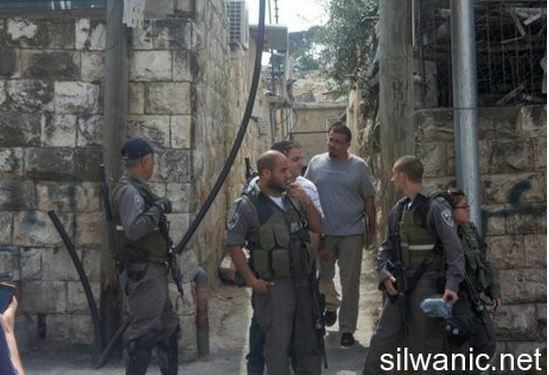 In addition, Israeli extremists accompanied by dozens of soldiers, invaded and occupied, a Palestinian land belonging to the al-‘Abbasi family in Wadi Hilweh. The 500 square/meter land is used as a playground for Palestinian children in the area. They also occupied a 1200 square/meter land belonging to Sha’ban family, and started bulldozing it before placing a mobile home, in preparation to establish a new outpost. Israel's interior ministry has announced that it demolished about 18 Palestinian homes in the Negev, within the last week, according to Al Ray Palestinian Media Agency. In a press statement, the Israeli interior stated that they oversaw a number of demolitions operation on homes, in cooperation with " The Jewish National Fund", "Kern Kayemt" organization and what is known as the "Green Patrols". Israeli authorities expanded the demolition of homes, and farmlands in Negev through the past weeks, with bulldozers raiding dozens of homes in Negev villages, then destroying them under the pretext that they were built without a permit. The campaign of demolition is still going until the date of this report, in a move that is seen as a race against time ahead of the Israeli elections to destroy the largest possible number Palestinian houses in the region in order to win more votes from electorate extremists. The Negev is scheduled to witness a mass widespread mobility after the Israeli elections, along with mass demonstrations against the dramatically continued scheme of homes demolition since the start of 2015. Head of the Kisan village council, Hussein Ghazal, said the mobile home was installed on the lands that were bulldozed two days ago, where Israeli intends to build a factory. Ghazal added that the many bulldozers and workers are operating in the area, while wood, iron and construction supplies have been bright to the scene. It is worth mentioning that the Applied Research Institute in Jerusalem (ARIJ) recently reported that Israel is trying to illegally annex lands belonging to Kisan village, in order to make them part of the so-called “Greater Jerusalem” settlement project. ARIJ conducted a geopolitical research on the issue, also examining the Israeli plans, maps, and the lands the army is bulldozing, and found out that the Israeli plan aims at expanding the Gush Etzion settlement block to reach all the way to the Dead Sea shores, as part of the “Greater Jerusalem” plan.